(21160.371014.8, Oklahoma Department of Transportation Collection, OHS). John Steinbeck did not invent the term "Okies," nor did his 1939 novel The Grapes of Wrath present their story for the first time. The term was loosely applied to the flood of folks coming from the south-central region, left with little means by the Great Depression, the drought, and the dust storms. They sought full-time agricultural employment in states where most jobs were seasonal. Because at the height of the picking season California had almost twice as many migrants as jobs, the would-be workers became the new poor. Local, state, and federal governments had never faced such an influx of needy people, and because the migrants were reluctant to seek assistance, they created shantytowns by the side of the road. They camped wherever they could, despised as white trash and rousted from place to place. When they were offered train tickets after the harvest, however, most said they did not want to go back. 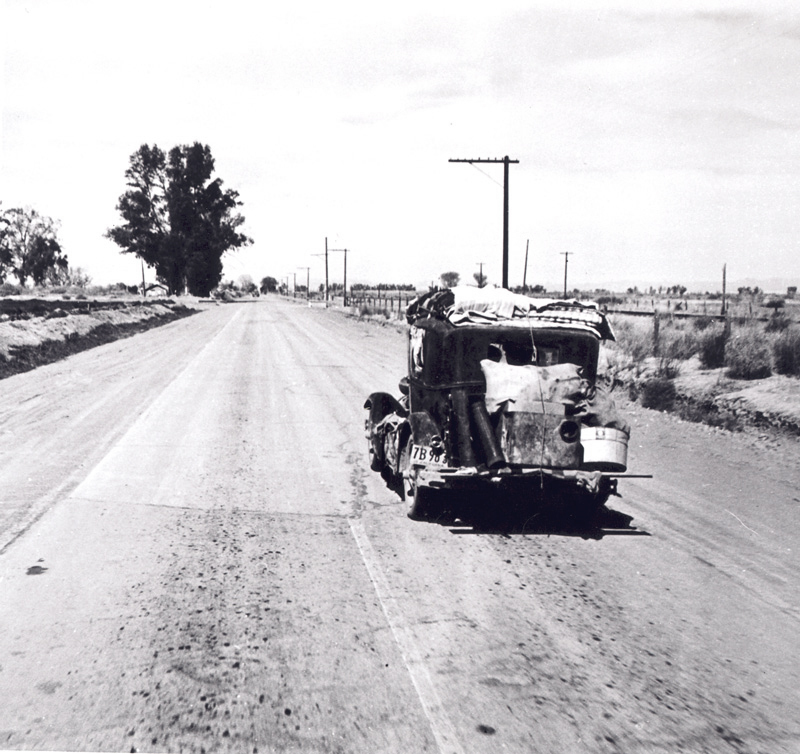 By the time John Steinbeck told the story of a representative family from Sequoyah County, Oklahoma, in his novel The Grapes of Wrath, his readers could easily put faces to them from having seen documentaries such as The Plow That Broke the Plains, Movietone newsreels, and photographs by Margaret Bourke-White and Arthur Rothstein. If John Ford's movie of the novel seemed classic on arrival in 1940, that was partly because he used the same photographic tones and shaped many of his scenes, down to the look of the people, on those famous familiar pictures. It helped that he had chosen a very scenic book, winner of a Pulitzer Prize for fiction in 1940. Arguments about the novel have quieted, and in 2002 even the town of Sallisaw, seat of Sequoyah County, celebrated the centennial of Steinbeck's birth. But early reactions to the best seller (second only to Gone With the Wind) were heavily weighted with criticisms of its decency, accuracy, and politics. The language and certain scenes prompted vigorous attacks, the most famous of which came from Oklahoma's U.S. Representative Lyle Boren, who entered his opinion in the Congressional Record that the novel was "a lie, a black, infernal creation of a twisted, distorted mind." Some library systems banned the book, though it was widely available and purchased in Oklahoma. Eleanor Roosevelt responded to such attacks with a defense of its realism: "The book is coarse in spots, but life is coarse in spots." Those upset by the language had some grounds for questioning whether folks brought up in Oklahoma's culture of Christianity would talk so, even if they were not "church people." But Steinbeck drew his characters from those he had interviewed in the migrant camps in California, after they had suffered considerably. One could argue that they, at times, lived down to the prejudiced views of them, in a state where "Okie" was almost a racial epithet. Thematically, their behavior supports Ma Joad's worry that they are losing their ties to each other and that they are in danger of breaking down as individuals. Perhaps a more telling point was made by the many literary critics who admired the poetry of their speech without interrogating its realism. Clearly, Steinbeck did not study Oklahoma closely. Many readers were left with the impression that Sallisaw was in the Dust Bowl and that farmland in the area was being combined into large holdings by banks and distant corporations. Such misconceptions aside, however, it was true that most of the Oklahoma migrants came from the more populous eastern half of the state, an area in which a combination of factors, including foreclosure, drove people onto the road West. California growers and businessmen actually had greater cause to be upset about the depiction of their neglect of and sometimes inhumanity to the workers. But Steinbeck's own earlier articles for the San Francisco News, other accounts, and even the Hollywood studio's on-location fact checking in preparation for the film all revealed that conditions were often worse than portrayed in the novel. There seems justification for the calls from some Oklahomans to send the state militia to protect their countrymen. A careful reading of The Grapes of Wrath reveals no advocacy of revolution, unless warning of unrest and possible violence, portraying the callousness of many, leavened by the charity of some, and urging more New Deal programs can be seen as extreme. For all the interchapters that put the Joads' plight in the broadest sociological terms, Steinbeck invests the family with warmth and caring, setting up the affecting and even dignified representations of Ma and Tom Joad in John Ford's film. From the Oklahoma perspective, the novel had several positive effects. The Farm Security Administration (FSA), responsible for assisting the migrants, was the only agency in 1939–40 to receive a bigger appropriation from Congress than had been recommended by the Bureau of the Budget. A little-known singer from Okemah, Woody Guthrie, was discovered at a concert to raise money for farm workers and went on to issue the album that made him famous, Dust Bowl Ballads, based on the novel. Finally, in 1946 George Cross, president of the University of Oklahoma, sought to help uplift the state's image by hiring a new football coach, Jim Tatum, who stocked the team with veterans who had played for him on an armed forces team, winning the Gator Bowl in his first year. He also brought an assistant, Charles "Bud" Wilkinson, who took over a year later, and the rest is history. From the California perspective, the "Okies" who stayed were often able to make a good living in agriculture or the defense industry as World War II approached. An excellent book by Dan Morgan, Rising in the West: The True Story of an "Okie" Family in Search of the American Dream (1992), contains a thorough account of the fortunes of an actual family from Sallisaw and the changes wrought in California as a result of the massive in-migration of the Thirties. In retrospect, one must admit that like the term "sooner," "Okie" has undergone a connotative renovation; both now seem to have become expressions of pride. Paul Bailey, "Researching Tom Joad: John Steinbeck Journalist, 1936," The Chronicles of Oklahoma 83 (Spring 2005). A Casebook on The Grapes of Wrath, ed. Agnes Donohue (New York: Thomas Y. Crowell, 1968). Margaret Lutz, "History of Weedpatch Camp," Arvin Tiller/Lamont (California) Reporter, 20 October 1999. Dan Morgan, Rising in the West: The True Story of an "Okie" Family in Search of the American Dream (New York: Random House, 1992). Steinbeck: A Collection of Critical Essays, ed. Robert Murray Davis (Englewood Cliffs, N.J.: Prentice Hall, 1972). "Vintage Forgiveness," Daily Oklahoman (Oklahoma City), 16 December 2001. William M. Hagen, "Grapes of Wrath, The," The Encyclopedia of Oklahoma History and Culture, https://www.okhistory.org/publications/enc/entry.php?entry=GR010.